I’m going to do another blog after this about what to expect when Alabama has the ball, but for now I’m going to talk about the line and what to expect from the LSU offense. I remember some disappointing Alabama games (see series blog for more), but even mediocre LSU teams have come within a touchdown in recent years, especially at home. In fact, LSU hasn’t lost by more than 10 points to Alabama at home since 2002, when a man named Nick Saban coached the Tigers to a 31-point mauling at the hands of Dennis Franchione’s Tide. That was also the last time Alabama scored more than 21 in regulation in Baton Rouge. I also wanted to mention that the last time a top-5 team was a 14-point underdog at home, both the favored team and the loser of that game was Alabama. You might remember a certain Iron Bowl game in 2013. The famous Kick Six. I forgot how close Chris Davis came to being pushed out by the kicker. The linemen never had a chance though. So the 14.5-point early line makes it mighty tempting to take LSU. One recent Alabama game (on the road though) gives me a little pause: the Tide won by 21 in 2013 (the season I just mentioned), but it was a tied game with under 5 minutes left in the third quarter. I think that was the only recent game with a similar offensive production on both sides as I’d expect here. Other than that game and the 2011 BCS Championship, every other LSU-Alabama game since that 2002 result I mentioned was decided by fewer than 14.5 points. In short, a closer game seems more likely than not. LSU was able to relax for the last quarter or so of a few games; but Auburn and Florida went down to the end, and LSU only really had a few minutes of leisure against the two Bulldog teams (Miss. St. ended the game theoretically within two possessions, and LSU was only up 13 against Georgia until about 4 minutes left). I don’t think given Alabama’s inexperience in such games that they would do what they did in 2013 though. On LSU’s side, Georgia was favored by 8.5 in early betting, and LSU won by 20 at home. 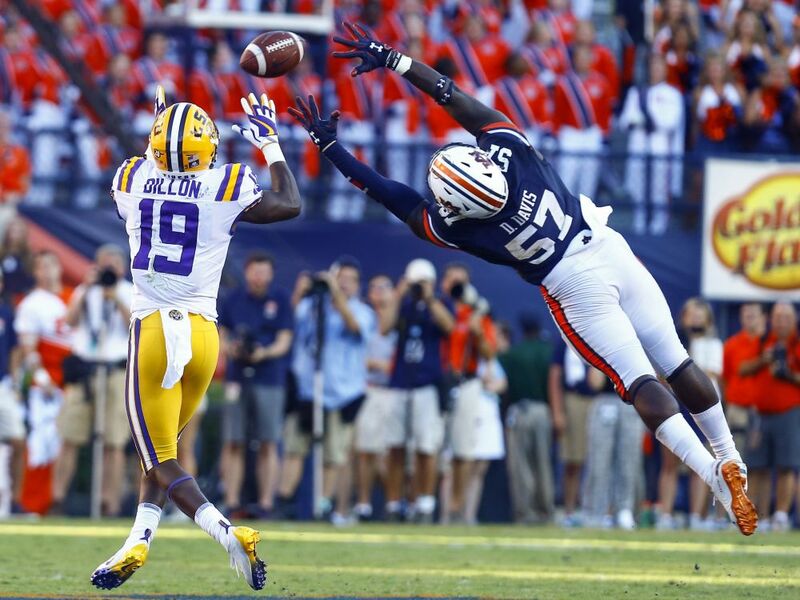 A few weeks before, Auburn was favored by 10, and LSU won by 1 on the road. In the first game, Miami was favored by 3.5, and LSU won by 16 in Arlington. So this wouldn’t be the first time that the Tigers out-performed expectations this season; and if LSU wins, it will be the third time they did so by more than two touchdowns. RB Clyde Edwards-Helaire fights for extra yards at home against Georgia. The Tigers beat the spread by four touchdowns. I’ll discuss it more in the next blog, but the best teams I’ve followed in the last 27 or so years of really paying attention have been tested at some point. The most consistently dominant team I remember was Nebraska in 1995 (I’ll talk more about them next blog), but even they had a game against an unranked team at home that they could only win by 14. LSU’s results against Auburn and Georgia also help my argument that this will most likely be the toughest game for Alabama. LSU also beat Mississippi St., who plays the Tide on November 9. Both that game and Auburn will be home games for the Tide, and the Georgia game (if it happens) would be in Atlanta with about half the audience on Alabama’s side. In the last blog, I mentioned that it hurt Alabama in the computer that Texas A&M lost to Mississippi St. It also hurts the real-life argument that the Tide really has been tested. Alabama only had one extra score on the Aggies than Mississippi St. did (they won by 22 points rather than 15 points), although Texas A&M was in the Mississippi St. game a good bit longer. Texas A&M justifiably fell out of the coaches poll and is now 25th in the AP poll. Despite the Tigers’ loss to now-#13/14 Florida, playing LSU is a significant step beyond a #25-to-30 type of team. The Alabama media, despite in many cases claiming it will be an easy game anyway, seems to agree that this will be the toughest test of the regular season. I know they don’t think in unison; that was just a good example. I think Nick Saban made a good point on Monday that you can’t really apply the statistics from earlier to the Tide’s schedule going forward. This is especially true on offense given that the A&M team I mentioned doesn’t have much of a defense. Saban also said LSU has the ability to be explosive in the passing game, which is true, but he didn’t even give Burrow one “very” when calling him a good passer. The full sentence in my head ended with “but he’ll be lucky if he completes half his passes.” Saban didn’t say anything about Burrow knowing when to step up in the pocket or throw the ball away when there is a pass rush outside of his field of vision. Maybe I’m cynical by nature (or maybe I’ve listened to Saban point out problems with own teams often enough), but when I hear a coach talk about what can go right on the very best plays, I think of what can go wrong on the plays that aren’t so good. Like this year, the best opponent Alabama had faced before the LSU game last year was Texas A&M. Although A&M may be better this year than last year, I think last year was better preparation for LSU because playing A&M on the road was probably a good approximation to playing LSU at home. I don’t think you can make the same argument about the reverse this year. In Alabama’s five SEC games before LSU last year, they gave up an average of 7.6 points, or about 2 ½ less than LSU scored. The average points given up in those games this year? 18.4. Last year the SEC average for the Tigers was about 22 points (1 fewer game though), and this year it was 28 points. So whether you want to say Alabama will give up 11 more or LSU will score 6 more, I think if it were a similar game plan and similar circumstances, LSU would score between 16 and 21. I think this year’s game being at home puts LSU’s upper limit more into the upper 20s (maybe even 30 or 31) than lower 20s though. In Alabama’s two road games against ranked teams last year (then-#16 Mississippi St. and then-#6 Auburn), the Tide gave up 24 and 26 points, respectively. As I think I’ve demonstrated, this Alabama defense isn’t as good as that one (though they can partly blame the offense for scoring faster). I think LSU can only get above about 31 if something weird like the Georgia game happens (basically along with LSU playing them harder than anyone else has, the Alabama offense hurts itself a lot more than it has before and puts more pressure on the defense). On the other hand, if the LSU offense hurts itself more than usual (basically if it looks like it did after the first drive and a half against Florida) and lets Alabama hold onto the ball most of the game, you could see LSU’s score going below the mid-teens and possibly into the single digits. So I think the best to look at how you get there is that LSU will have to score about the top 45% of its range of points, and Alabama will have to score in the bottom 45% of its range out points for LSU to win (just to throw out a number, maybe 25 or more). I’ll talk about the range for Alabama next time. I might even give a guess as to the final score. I wanted to say a couple more things about the Georgia game. I did think LSU would lose more likely than not, and I didn’t see them winning by more than 7 if they did win. In my defense, if you had told me ahead of time that LSU would win the turnover battle 4-0 and would only be penalized twice for 19 yards, I would have picked LSU to win by double digits. It was just hard to make that prediction after the Florida game. We could probably beat Alabama by double digits if we’re able to do that again. There is just an extremely low chance Alabama will turn the ball over that many times without forcing any though. 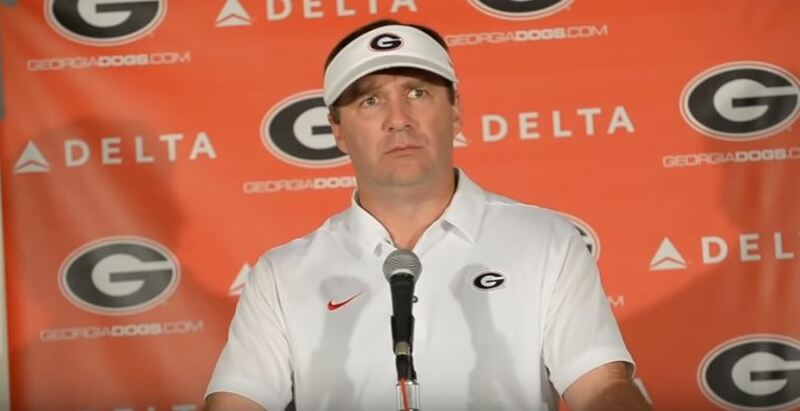 Kirby Smart doesn’t always look worthy of the name, but he knows a thing of two about defense. LSU has won 21 straight home games in the month of October. That’s partly because we play Alabama in November, and we had a couple of long streaks that were ended at the hands of Troy (the record regular-season non-conference winning streak) and Mississippi St., (a streak against the Bulldogs) respectively, in recent Septembers. But there is something to be said for the streak. When we haven’t started well, we usually recovered by this time. When we have started well but didn’t finish well, we still played well up until the Alabama game. I didn’t see the Mississippi St.-Auburn game, but I wish that I had. I understand the Bulldogs added some wrinkles in the running game that they didn’t have against Florida. Most of those 349 yards were by Nick Fitzgerald, the quarterback; but lead running back Kylin Hill averaged over 5 yards per carry, so you can’t dismiss that easily either. Against Florida, Hill ran fewer times with fewer yards per carry, so it seems their running attack can wear down defenses. 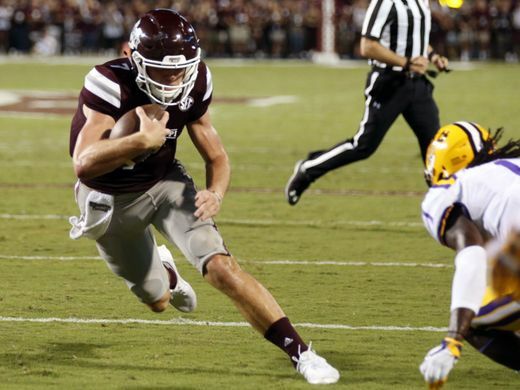 I don’t know if trying to run the Mississippi St. offense against Dan Mullen was going to work very well regardless, but that doesn’t mean LSU can easily stop it even if nothing changed in the weeks since. We certainly didn’t do a very good job last year or in 2014 (when the Bulldogs broke LSU’s 14-game winning streak and 11-game home winning streak in the series) against Mississippi St. offenses with a similar philosophy. With spread and option-oriented offenses it’s hard to be able to cover the whole field horizontally without opening up runs toward the middle of the field. Sometimes our players can also be too fast to run into the backfield, and then before you know it, the running back (or quarterback in their case) is in the defensive secondary. 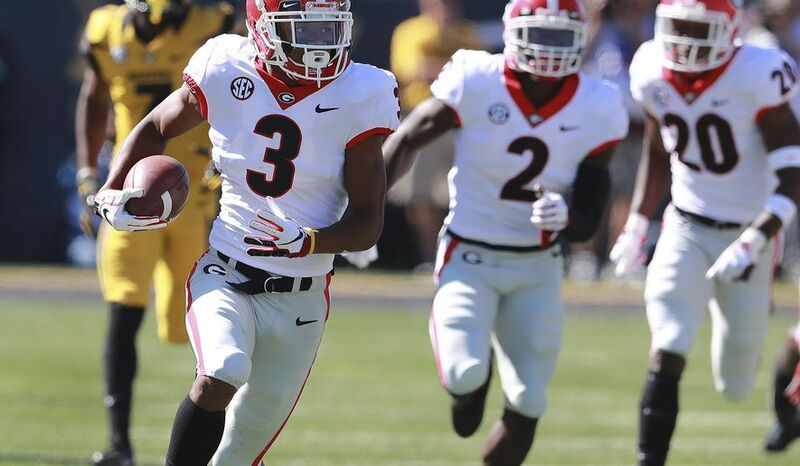 Against LSU last year, the Bulldogs had almost 6 yards per carry. The good news is the Bulldogs only completed 9 passes for 69 yards against Auburn, so that’s probably one area where they won’t be able to do as well against LSU as last year (when Fitzgerald threw for 180 yards). It seems that after the Florida game, the Bulldog coaching staff made some of the same observations I had about Georgia hurting themselves by going away from the run and ending drives with incompletions. Miss. St. QB Nick Fitzgerald runs for a touchdown in Starkville last year. Fitzgerald accounted for 268 yards and 4 touchdowns for the game. I think State makes up for their need to rely on running more than they did initially by having a better defense than it had in some of those past years though. 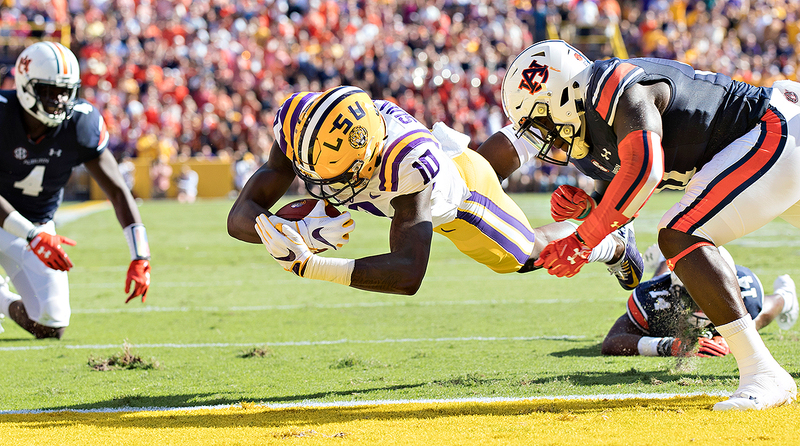 LSU only scored 7 points against them last year, but Auburn scored 49 against the Bulldogs last year (compared to 9 this year) and three other teams scored over 30 (which no one has done so far this year). Another positive is our offense is running a lot better than when we played them last year. We scored some points early on last season, but it was against BYU, Chattanooga, and Syracuse teams that struggled to defend against even mediocre offenses at times. Obviously scoring 36 against Georgia, even with the assistance of turnovers, is much better than anything we were able to do in the early games last year. Even in the relatively poor showing of 19 points against Florida, that was with multiple drives of 30 yards or more that didn’t result in any points. It’s possible we could be held to around 20 points again; but I think that’s very close to the floor, at least against anyone other than Alabama. I also have a slight concern because where the Mississippi St. defense does allow yardage tends to be in the passing game. I can see more problems with relying on Burrow if it comes to that than relying on the running backs. Burrow also still has a problem with holding onto the ball too long to look for receivers. This resulted in multiple sacks against Georgia, a team that only records half as many sacks on average as Mississippi St. Despite last year and some of the other areas of concern, I’m going to pick LSU to win a close one, something like 24-20. It’s another opponent with a good field-goal kicker. They haven’t needed him much, but he’s kicked two field goals of 45 yards or more. I’m predicting a closer game than either SEC fans commentator. Part of the reason is LSU did a lot of good things as far as sustaining drives against Georgia (as they also did in earlier games), which I think helps in their statistical model; but I think the Tigers have shown they won’t necessarily do the same things as well (or as poorly) from week to week. I think the talent and general competence will be just enough to get them over the top if the Tigers do regress slightly. I’ll just mention a few other minor things that really didn’t play a role in this prediction. There are some general problems LSU has had with offenses like this that I covered above, but you can’t get too hung up on the final score from the previous year. In 2007, for instance, we lost to Kentucky after beating them 49-0 the year before. In 2015, we beat Auburn easily (45-21 after leading 38-7 at one point) despite losing to them by 34 the year before. I mentioned this earlier, but if someone wins the turnover battle 4-0 like in the Georgia game, that can change outcome by double digits. I didn’t think last week’s result was reason to drastically change my approach to predictions. I think we have had a tendency to lose focus and motivation in other areas when we commit a turnover. On the other hand, we generally put points on the board when the other team commits a turnover. Ed Orgeron has only beaten Mississippi St. once as head coach, a 20-3 win in the 2004 Egg Bowl; but he the good news is he’s 1-0 at home against the Bulldogs (and 0-3 on the road, but we’ll worry about that next year). Before I get into specifics, you may want to see my detailed (and annually updated) post about the LSU/Florida series. LSU will win, but LSU can only beat lesser teams? I saw a video previewing the LSU/Florida game on YouTube, and I should have known better, but I clicked on it. They’re picking LSU to win, and that’s great. 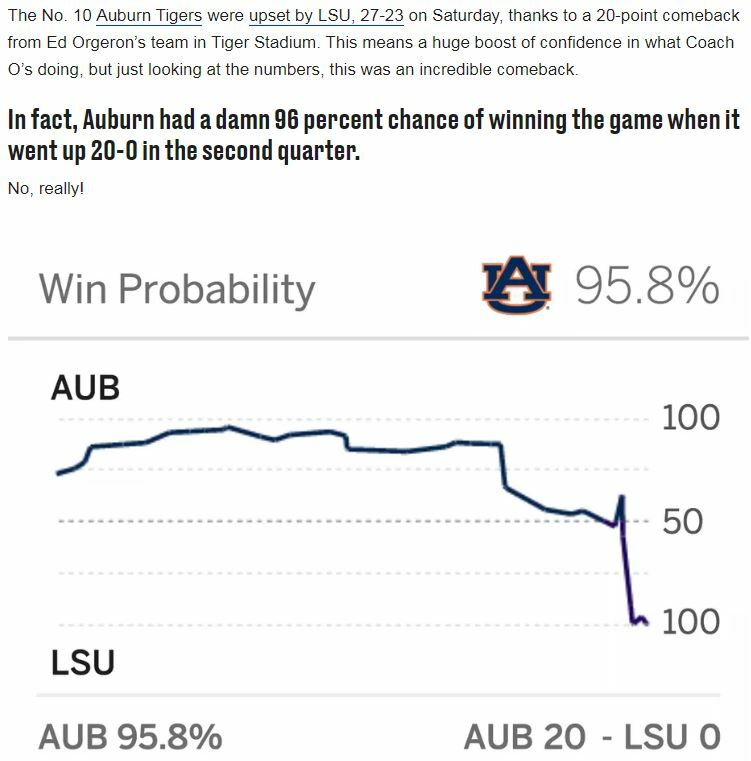 I think LSU has a greater than 50% to win (although the FPI says LSU only has a 40% chance), as I’ve said since the Auburn game. Their predicted margin of victory is on the high end (27-13 and 24-13, respectively). I’m expecting something closer to 24-20. The problem is they had to say derogatory things about our coaches. Both contributors to the video independently say LSU’s coaches aren’t good enough to beat teams better than LSU. What was the win over Auburn last year? To say the better team won a given game you have to look at all the games apart from the one they played against each other. I too seem to remember LSU’s win over Auburn last year as an upset. LSU was 8-4 last year if you take out the Auburn game. They lost to a good Troy team, but it was Troy nonetheless and couldn’t even give Mississippi St. much of a game. The only win over a ranked team was over Florida, who obviously ended up nowhere near the rankings. The Fighting Tigers did not play Georgia. Auburn was 10-3 taking out the LSU game with wins over two teams who were #1 at the time. They also beat Mississippi St., a team who was in the top 25 and deserved to be there (after easily beating LSU), 49-10. Their losses were to #3, #6, and #12. I think LSU’s final record is slightly misleading because of my opinion about the Notre Dame game, but Auburn played better in their bowl game against Central Florida than LSU played in their bowl game anyway. Regardless, both in hindsight and at the time LSU was supposed to lose. Even after the game people (including Gus Malzahn) talked about Auburn still being able to win the West despite being a game behind LSU and therefore not controlling its own destiny absent another LSU loss. Then the makers of the video acted like they must have made a great video because both Florida and LSU fans took umbrage. Florida fans aren’t happy they just won a well-played game and here someone is telling them they’re going to lose by double digits at home. I don’t expect them to be happy about that (even if there is a fair chance it will turn out to be true), but just because you say something to anger LSU fans as well doesn’t mean the video got both teams about right. So if they said both teams were going to finish with losing records in conference. would they have been right just because both fan bases would have been reacted to that with skepticism if not anger? How do you not think, “Let’s look at the handful of big wins Orgeron has had in just over two seasons and see if what we’re saying might not be true”? Another thing that annoyed me was they both discounted LSU’s win over Ole Miss as if the Rebels were the Little Sisters of the Poor, but then they quoted Florida’s stats against Colorado St. and Tennessee as if they proved something. Mississippi St. isn’t a bad team, but that was the only thing close to a quality win. The Bulldogs play Auburn on Saturday. I guess we’ll see how beating them compares to beating Auburn then. Not to mention how losing to Kentucky compares to any LSU game so far. The FPI, ESPN’s power index, still seems to be selling LSU short, by the way. It still predicts 4 losses. When Mississippi St. lost its second game in a row, it finally decided the Tigers had a greater than 50% chance of beating the Bulldogs, but on the other hand it gave Florida a greater chance to beat LSU. LSU is still predicted to lose to Georgia, Alabama, and Texas A&M (to whom they have not lost in 7 games going back to 2010). Why do I think the game will be closer than the guys in the video said? Like I said about the Auburn series, even sub-par Florida teams can be tough to beat on the road? Florida finished 4-7 last year. They say Ole Miss is terrible, but Ole Miss already has 3 wins, and they still have ULM, Arkansas, Vanderbilt, and Mississippi St. to play. I’ll be shocked if the Rebels don’t win at least two of those games, so if a terrible team nearly beat last year’s LSU team, a much-improved Florida team can beat a slightly-improved LSU team. Why do I say slightly improved? If LSU had slightly better play-calling and field-goal kicking last year, they would have beaten Troy and Notre Dame (despite the officiating) and finished 11-2. Even though LSU is undefeated right now, 11-2 is still a lot to hope for. For me, “much improved” would mean either playing in the SEC championship game or tying Alabama at one SEC loss apiece (and losing head-to-head). It would also require a post-season win either in the SEC Championship or in a consolation CFP bowl. It’s a possibility, don’t get me wrong, but we aren’t there yet. 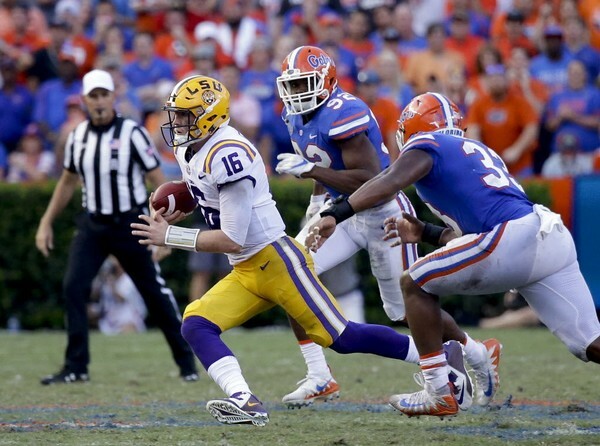 LSU’s then-QB Danny Etling evades the Florida defense in the 17-16 LSU win in Gainesville last year. The last trip to Florida before last season wasn’t against a great team either, with the Tigers winning 30-27 in 2014. LSU and Florida finished with similar records that year, but that was the LSU team that took Alabama to overtime and should have beaten them but for a personal foul and kickoff out of bounds in the last two minutes. Anyway, the Tigers would win after a wild fourth quarter. Florida returned a punt 53 yards with under 7 minutes left in the fourth quarter, which set up a touchdown to put the Gators ahead by 4. It seemed like the game was over a few minutes later when LSU faced a 3rd and 25 from their own 33 with 3:33 left (not a typo), but Anthony Jennings (not remembered as our most effectual quarterback) had no problem with this and threw a 41-yard pass on that down followed in short order by an 11-yard touchdown pass (both to Travin Dural). Florida seemed to be in control again when the Gators completed a 73-yard pass on the next play from scrimmage to set up a first and goal from the 2. Two running plays combined for one yard, and then an incomplete pass led to a field goal, which tied the game at 27. LSU struggled offensively, giving the ball back to Florida with 54 seconds left after the Gators had called a timeout to give themselves a chance to win the game in regulation. For some unknown reason, Florida QB Jeff Driskel threw a risky pass even though the Gators had a first and 10 less than 20 yards from the potential winning field goal. LSU intercepted, and this set up the winning 50-yard field goal by Colby Delahoussaye with 3 second left. Both the 2012 and 2010 games at Florida were decided by one possession apiece as well. LSU was much better in 2010, but that had a crazy ending to that I won’t get into here. This video might help jog your memory. For more about the LSU-Florida series, see here. I have every game in the series since 2004 listed there. This is the 7th time since 2007 that LSU has started the season with 5 straight wins or more. That includes 2010 and 2012 season, but 2015 was the only other instance since 2012. So the last six times this has happened it did not lead to a national championship, although LSU was 13-0 with a conference championship before losing to Alabama in January 2012. In both 2009 and 2012, the first team to beat LSU after such a start was Florida. 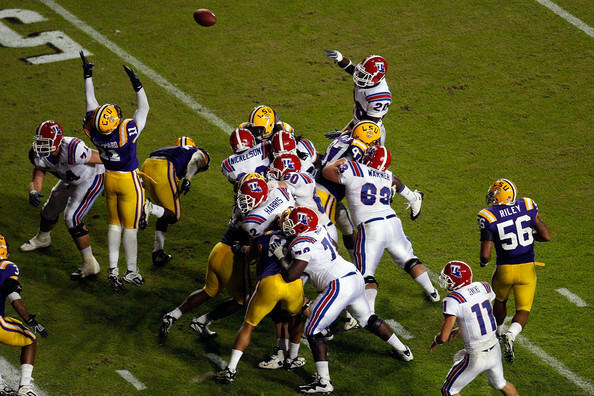 In 2008, Florida beat LSU immediately after the Tigers started 4-0.